When Indore-based Aarav Srivastav bought a mobile phone for Rs 40,000 on a six-month EMI, the 26-year-old thought he would have to make a down payment of Rs 5,500 and the equated monthly instalcost ment would work out to Rs 5,750. But, to his surprise he had to pay Rs 6,250 per month, or an extra Rs 3,000, for the device - the added cost comprised processing and interest fees. An EMI scheme is nothing but a loan product, where you get to buy and start using the merchandise immediately but pay for it over an extended period of time. The lenders break up the loan repayment in instalments and interest rates are charged accordingly. The EMI value depends on the loan amount, interest rate charged and the tenure. According to data from National ment would work out to Rs 5,750. But, to his surprise he had to pay Rs 6,250 per month, or an extra Rs 3,000, for the device - the added cost comprised processing and interest fees. An EMI scheme is nothing but a loan product, where you get to buy and start using the merchandise immediately but pay for it over an extended period of time. The lenders break up the loan repayment in instalments and interest rates are charged accordingly. The EMI value depends on the loan amount, interest rate charged and the tenure. According to data from National Sample Survey Organisation (NSSO), Indians are now deeper in debt than ever before - average debt per household in rural areas has increased by over 330 per cent in the past 15 years, while urban areas have witnessed a 620 per cent rise. "We must understand that when you purchase something on EMI, it may be for immediate gains, but pay for a period of prolonged pain," says Lovaii Navlakhi, Chief Financial Planner, and founder and CEO of International Money Matters. Therefore, before you plan to buy something on EMI, or even consider taking a step-up loan, here's what you must know. Inflated costs. You are buying something that you cannot afford in the immediate future, but in the process, paying far more than the product instalcost. This might not be rewarding for your financial health. Evaluate all extra costs associated with the EMI scheme you are likely to opt for and take an informed decision. Additional fees. Most EMI schemes come with hidden costs - interest costs and processing fees. It may appear that the scheme is beneficial and you are not paying anything extra, but most offers increase the final cost of the product. You may also be paying for convenience fees and the retailer's processing fee of 1-2 per cent (the percentage on transaction amount will vary from one bank to the other). Once you buy a product on EMI, you have to make regular payments. If you fail to do so, or miss the deadline, you will eventually end up paying a huge penalty. Long-term debt. EMI schemes help you bring within your reach goods that you might not have been able to otherwise afford - from kitchen appliances and washing machines, to high-end electronic gadgets, including smartphones, tablets and LED TVs, among others. Remember that consumer goods are essentially depreciating assets and you are paying more for something that is fast losing its value in the resale market, and paying more for it over the long run. Easy on the wallet. To the eyes of the layman, EMI schemes are very attractive and easy on the purse. But note that there is no such thing as a free lunch. EMI may save you from burning a hole in your pocket right away as you pay a token amount as down payment, and then pay in easy monthly instalments, but it is actually increasing the burden on your wallet over a period of time. 0% EMI. Zero interest costs are a misnomer. There is no such thing. There are hidden costs always attached to it. It is a ploy to help boost demand of premium products and in the process to increase sale. "Borrow money only for essential things; only if you must, and not for fun or expendable items. Buy only when you have the necessary funds available to ensure that you do not harm your fi nancial health," suggests Sudipto Roy, Managing Director, Principal Retirement Advisors. Paying for high-end mobile phones, where you may not use 70 per cent of its features, might not be a smart move. Technology is ever changing, and within a few months you might be holding an obsolete device. And, if you lose the phone, you end up paying EMIs for something that you don't even possess. Your credit score. 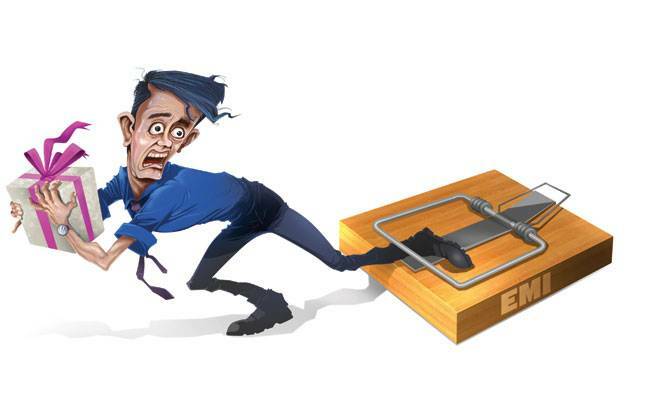 One of the most important negatives of EMIs is that it can harm your credit score. Credit score is a number based on your credit report, which is a summary of your past and current borrowings and your repayment history. A good score will help you get credit and loan facilities easily and on good terms, while a bad score will harm your borrowing interests. Your EMI-to-income ratio is an important factor for the approval of a new loan. So, keep it low. If your consolidated EMIs exceed 50 per cent of your monthly income, your loan application may be rejected. The consequences. Serious consequence arises when one fails to make timely payments. Repossession of purchased commodities, heavy penalties or even strict legal action against non-payments can be expected. EMI amount gets refl ected on monthly credit card bills along with other dues. So when you fail to pay your dues, you will be charged normal interest for non-payment along with a late payment fee and taxes. The EMI amount, in addition to these charges, will also carry basic interest costs that would result in huge additional expenses. Step-up loans. Buying a house or an apartment is a big-ticket event. Most will not be able to afford to purchase a house in cash as home prices are going through the roof. A home loan with EMIs is the best option to fund such a costly acquisition. When you take a large loan, get the best possible interest rate and repayment options that work for you. A leading public sector bank has recently launched a Flexi Pay scheme that allows borrowers to get higher loan amount compared to their loan eligibility under regular home loan schemes. Borrowers also have the option of paying only interest during the moratorium (pre-EMI) period of three to five years, and thereafter pay moderated EMIs. The scheme looks attractive but there are a few points you need to be aware of. There is a risk of being overburdened if your salary does not rise according to your expectations. Buyers also need to factor in rising interest rate while going for step-up loans. Since there is no guarantee of job stability and rising salary, a higher loan amount can pinch you later when the EMI increases. Loan tenure. The sooner a loan is closed, the better. If you don't have any other debt, opt to pay a higher EMI if you can afford it instead of increasing the repayment tenure. This will allow you to wrap up the loan early, and help you step out of the debt trap. However, remember that debt is not always a bad thing, but if you form a habit of taking loans for everything, you are weakening your financial position. So, tread carefully in the world of attractive loan offers.